Communication and cooperation are crucial to progress and problem-solving. This truism was on full display at the Paris Peace Forum, where SpotMe was honored to be the event app provider in facilitating potentially world-shaping conversations. At the Forum’s inaugural event, which was produced by the prestigious event agency Auditoire, 10,000 global participants had at their fingertips the tools to organize their daily schedules and to communicate with other peace enthusiasts in attendance using the SpotMe app. Networking and participant learning were essential to the achievement of the Forum’s mission. As such, SpotMe elevated the Forum event app’s communication capabilities through the integration of the peer-learning platform Braindate, an experience that allowed participants to book face-to-face meetings with like-minded participants based on shared interests and goals. The results of this innovative integration demonstrate the impact that a powerful, seamless event app can have. 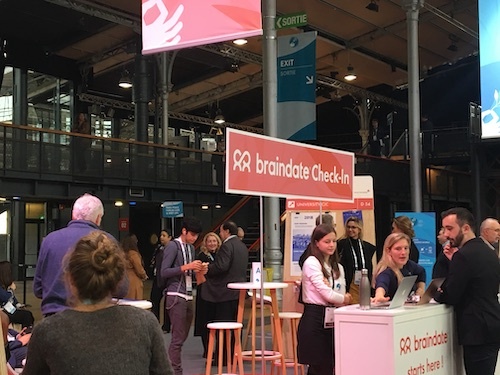 Participants booked hundreds of braindates throughout the app, and each group braindate triggered three times as many connections than a typical meeting arrangement. That is networking, supercharged. Braindate’s facilitation of in-person meetings empowered SpotMe app users to turn digital connections into real-life conversations. Meanwhile, SpotMe’s seamless user interface made using Braindate during the Forum exceedingly simple; participants could add, modify, or accept invitations using the same app they consulted for their agendas and reading materials. Scheduled braindates would be automatically added to a participant’s daily schedule in the SpotMe app. Notifications powered by SpotMe in the form of push alerts or a Daily Digest would remind participants of an upcoming meeting, so there was no risk of missing a braindate. 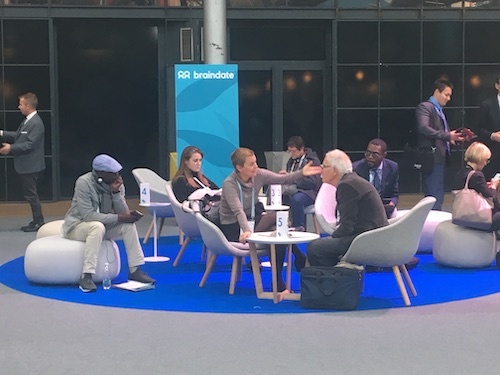 The SpotMe-Braindate integration made a powerful impact at the Paris Peace Forum for participants who used the SpotMe app to make meaningful connections. For some, the real value was in the way that braindates removed the guesswork from networking. For others, Braindate’s impact became more clear after their meetings wrapped up. By meeting with peers who share their goals and passions, many participants found that their meetings at the Forum were vastly more productive than they might have expected.